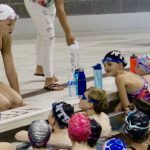 Within 250 miles of Avon, CO.
Give your swimmer the opportunity to get ahead of the competition at this High Performance FFT Swim Clinic. 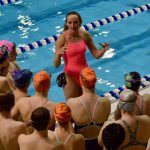 Two-time Olympian Chloe Sutton will be in the water teaching your swimmer the proper technique for FASTER turns, underwater dolphin kicking, and finishes as well as dryland exercises to improve your swimming. Blast through the turns, into underwater dolphin kick, and finish ahead of the competition at this swim clinic designed to help competitive swimmers improve upon the key details that are essential to swimming fast and improving your times. Olympic swimmer Chloe Sutton will teach all participants the drills that they need to practice to master these skills. FLIP TURNS: Learn to carry your momentum through the turn to get ahead of the competition every wall. Use your core and your arms to get through the turn and then plant your feet on the wall for a powerful pushoff in the perfect streamline. Chloe Sutton is an Olympian due to her discipline and focus when executing a proper flip turn. Practice drills and exercises to help you master this athletic skill. UNDERWATER DOLPHIN KICKING: The fastest swimmers in the world dolphin kick off of their walls and breakout ahead of the competition. It's not as hard as you think. Chloe will help swimmers improve their technqiue as well as commit to a number of kicks off of every wall so that they can imporve their underwaters now as well as in the future. FINISHES: Races can be won and lost by hundredths of a second. Many races come down to the very last stroke. Your swimmer will learn how to drive their legs, elongate their arms, and keep their head down so that when it comes to close races, your swimmer always comes out on top. DRYLAND: A good dryland program can compliment your swimming and help you get to the next level. Learn from Chloe what kind of exercises can improve your athleticism, strength, as well as flexibility all while also preventing injury. ASK QUESTIONS: Swimmers and parents are invited to ask Chloe questions during a Q&A session. Gain insight into her training regimen, diet and nutrition, and recovery tactics. WATCH THE CLINICIAN: Observe Chloe swim at full speed and demonstrate a progression of perfectly executed drills to achieve powerful, efficient and fast swimming.